The flag of Sri Lanka’s distinguishing mark is the golden lion with its right fore paw holding a sword, thereby making the flag also known as the Lion Flag. The lion is set on a crimson background with one golden bo (sacred fig) leaf at every corner. To its left are two vertical stripes of the same width and length in green and saffron, the green stripe closer to the hoist. Between the stripes and the lion, and around them are borders in yellow. The lion has played a significant role in Sri Lanka’s history. Vijaya, Sri Lanka’s first king, brought with him a banner with a lion when he first arrived at the island in 486 BCE. The lion, in general, represents bravery, but there are distinctive meanings to every design within the golden lion. The curly hair of the lion represents religious observance, meditation, and wisdom. Its beard represents purity of words; the nose, intelligence; the fore paws, purity in handling wealth. The sword that the lion holds represents the sovereignty of the nation. The handle of the sword stands for the elements: water, earth, air, and fire. All together, the lion and the maroon background represent Sinhalese ethnicity as well as strength of the nation. The bo leaves represents Buddhism and its bearing on the Sri Lankan nation. The leaves also represent the four Buddhist virtues meththa (friendliness), karuna (kindness), muditha (happiness), and uppekha (equanimity). 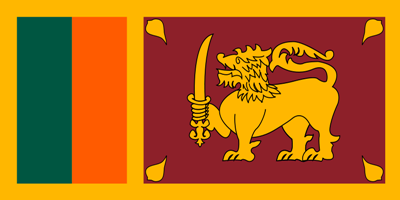 The green stripe represents the Muslim faith and the Sri Lankan Moors, while the saffron stripe represents the Sri Lankan Tamils. The crimson background also represents other minor religions and groups, including the European Burghers. It also alludes to the country’s rich colonial heritage. The yellow border represents other ethnic groups in Sri Lanka, the Sri Lankan Malays, for example. Incorporating the minority groups with the majority race, the flag of Sri Lanka is indeed a rallying tool for all Sri Lankan groups and a great representation of the nation and its heritage.